This is an amazing sandwich that I know you will love. I used a crusty artisan bread and made my own spicy hummus sandwich spread. After spreading on my hummus, I added sliced apples, tomatoes, grilled portabello mushrooms, Mezzetta roasted red peppers, Mezzetta jalapeno stuffed olives, basil leaves & romaine lettuce. Talk about flavor plus in a sandwich!! You could also grill this or put it in your panini maker, just add the lettuce after your sandwich is done cooking. 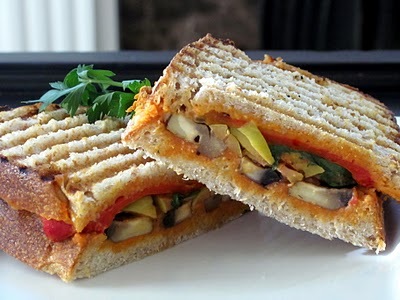 See picture below for this same sandwich panini style. I hope you will give this sandwich a try because I know you and your family with love it. 1.) Grill 8 long slices of a large portabello mushroom in 1 tsp. olive oil. Lightly salt and pepper and cook for 2 minutes. Add 3 tbsp of water all at once and continue to cook 2 additional minutes. Remove from heat. 2.) Spread all 4 pieces of artisan bread with 2 tablespoons each of hummus. Slice apples and tomatoes into ¼ inch thick round pieces. 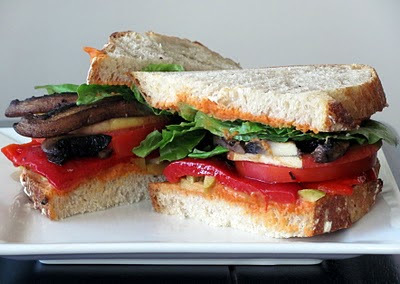 To one side of each sandwich add 4 portabello mushroom slices, 2 slices of apple, 2 slices of tomato, ¼ cup roasted red peppers, 4 sliced olives, 4 basil leaves and romaine lettuce. Put the other slice of bread without the vegetables on top to make a finished sandwich. Put all ingredients in food processor or higher powered blender and blend until smooth. Stop and scrape sides of blender several times. 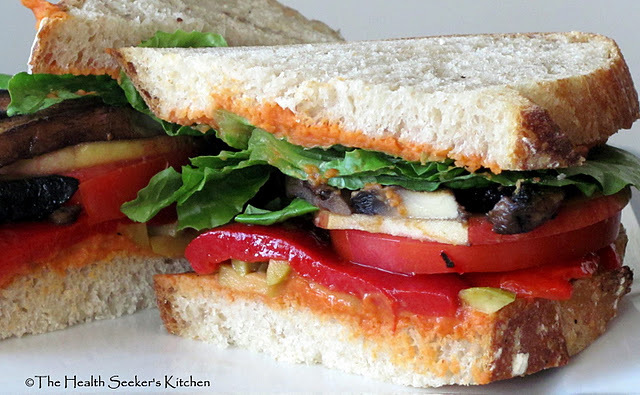 These are my favorite kind of sandwiches... simple and full of fresh ingredients! The spicy hummus sounds so good! We should do paninis for a Sunday dinner. Apple Slices?! That's out of left field. I have made your Hummus & Tempeh Panini a few times and love it. I found your blog through Foodblogs this morning and have had a great time looking through your posts. Your spicy hummus recipe sounds great - I've never thought to add a touch of sweet when making my own. Looking forward to trying it! Heather-we will definitely make paninis when we get together next time. Shen - I know it is really different to add the apple slices, but it is so yummy - trust me on this:) Please let me know if you try the apples and how you like it. The Bread Class looks interesting!